Marjaana Rakai Be Sisu Fit Inc.
She is a former cross-country ski athlete at Finnish national level, track & field athlete, weekend warrior, runner and a triathlete training for Ironman. She has a Master's degree in Sports Science from the Norwegian School of Sports Science (Exercise Physiology & Biomechanics), NASM personal trainer certification and always learning about training. Marjaana is a former cross-country skier in Finnish national level, track & field athlete, runner and now a triathlete training for Ironman. She is also a world traveler, wife, mother of three young children, running coach and a believer of continuous learning. Marjaana holds master’s degree in Sports Sciences from Norwegian School of Sports Sciences, with specialization in Biomechanics and Exercise Physiology. She has also Personal Trainer Certification from NASM. Her knowledge in Exercise Science goes way beyond master’s degree. She has over 30 years of experience of being an athlete- with it comes both ups and downs in forms of victories, goals reached and injuries. She has coached runners of all ages from children to adults in all running ability levels. 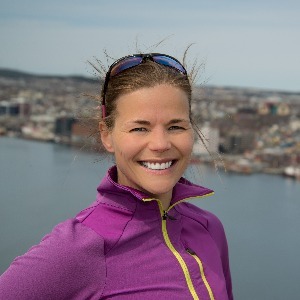 She works with athletes from beginners to seasoned athletes in running and Nordic skiing. One of the cornerstones of her coaching philosophy is strength training. She believes all levels of runners can maximize their running capabilities by hitting the gym regularly as research has shown benefits of strength training in endurance athletes in form of injury prevention and increased running economy. She has been involved in a variety of sports from running, cross-country skiing, snowboarding, alpine skiing, surfing, and triathlon. She is currently training for Ironman aiming to qualify for the World Championships in Kona in 2019. Success. Coach Marjaana Rakai has been notified of your message.